More than a foot of snow covered the playing surface at Citizens Bank Park last week, but workers were busy assembling the new giant video board out in left field. 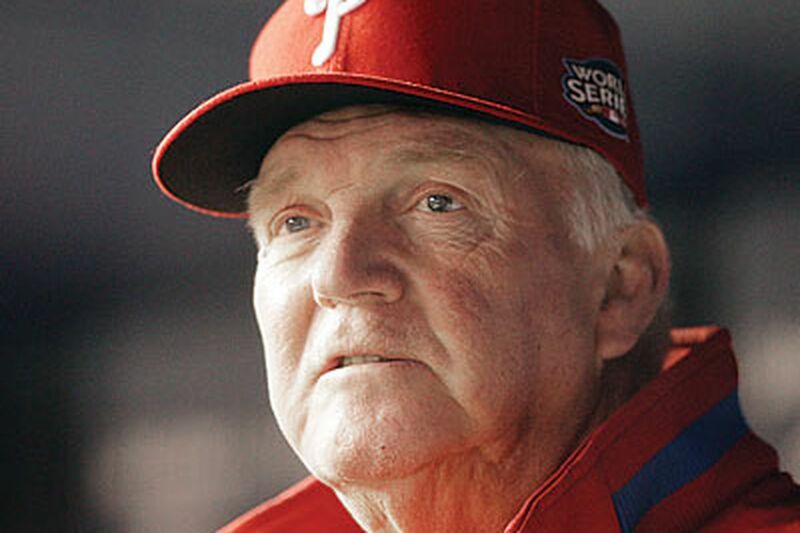 Charlie Manuel knows the chill of winter will soon be replaced by the thrill of a new season. With lefthander Cliff Lee rejoining the team, the Phillies manager has more studs in his starting rotation than a Kentucky horse farm. Manuel, who will head back to his Winter Haven, Fla., home this week briefly before the Feb. 14 start of spring training, took some time in his ballpark office to answer questions about his Four Aces (Lee, Roy Halladay, Roy Oswalt, and Cole Hamels) and a variety of other subjects, including his personal life. During a 30-minute question-and-answer session, Manuel talked about his love for his longtime companion Missy Martin, his five children, and his passion for the Philadelphia area. Question: All the talk is obviously about your Four Aces. Does that put more pressure on you as the manager to win? Manuel: "No, I like it. Pressure to me is what you put on yourself. I think you know our philosophy: Every day is the moment for us. We don't look back and we don't look forward. That day, we're going to come to the ballpark and we're going to win the game. My slogan is, 'We do it because we want to and not because we have to.' "
Q: You have the Four Aces, but the Boston Red Sox have a lineup of hitting stars. As an offensive guy, were you at all jealous of what they did during the off-season? Manuel: "They have a big-time offense . . . there is no doubt about it. But if you remember, Detroit two or three years ago, they had Miguel Cabrera, [Placido] Polanco, and [Gary] Sheffield, and all these guys, and one of their coaches told me they would score a thousand runs. Well, they didn't score a thousand runs. You still have to play the game, and you still have to hit the ball. As Chase Utley would say, 'You still have to stay focused for 162 games.' They have a big-time lineup, but I look over there and the Yankees have a big-time lineup, too. "I know we have changed our ball club and now we're about pitching, but our offense is still capable of doing good. People talk about our offense and what we're going to do. If you stop and think about it, our guys are 30 or 31 years old . . . and people are talking about them getting old. Yeah, we have Raul [Ibanez] in left field who has some age on him, and Polanco is getting a little older, but he can hit. He can put the fat part of the bat on the ball, and he can execute with anybody. Ibanez really came back the second half last year, and he ended up with 83 RBIs, and he was only two behind Jayson Werth. We have a lot of ifs, but what I'm trying to say is if [Jimmy] Rollins and [Chase] Utley and [Shane] Victorino come back and have the kind of years they're supposed to have, our offense will be very good." Q: Can you describe each of your aces? Manuel: "You talk about Halladay, to me he is a bigger, stronger [Greg] Maddux with more of an arsenal. And then when I look at Lee . . . he commands the game. He works fast, always knows what he's going to do, and the defense has to always be ready. He doesn't let the hitters step out. He picks it up and fires it. [Roy] Oswalt is more of a power guy, really. When he's getting his breaking ball and change-up over, he's really tough. And then you have [Cole] Hamels, he's more of a finesse guy who can pull the string on you. And now he has a cutter to go with his fastball and his command. We have different style pitchers. And even Joe Blanton, you put him in the five-hole and he becomes a different pitcher." Q: Can your offense be better without Jayson Werth? Manuel: "Yes. When you have a weakness or a hole or somebody is not producing, we go and find somebody. In the middle of the season, they find somebody every year. We definitely want to accomplish our goals. But 21/2 years ago, Jayson Werth beat somebody out. Now, we have Domonic Brown, we have Ben Francisco, we have John Mayberry. We have to find the best player between those three, or all three of them might be good. That's not a big deal to me. We're going to find that guy who is going to help us." Q: Why do you think Ryan Howard's home-run total was down last year? Manuel: "He has always hit good in September and always finishes strong. He hurt his ankle last year in August and he sat out 15 days on the disabled list. When he came back, his ankle was still hurting him, and he didn't make a big deal out of it, but that is the leg he puts his weight on. It is his push-off leg. He's a balanced, rhythm hitter. That was the lowest he had ever hit in September as far as power goes. Ryan Howard is a 40- to 50-home-run guy, and he has proven that. Those ones he missed last year, he might come back and add them on this year, so the pitchers better look out." Q: What's the greatest pitching staff you can remember? Manuel: "I would say the Baltimore Orioles with all those 20-game winners [Jim Palmer, Dave McNally, Mike Cuellar, and Pat Dobson in 1971]. And then the [early 1970s] Mets in my time had [Tom] Seaver, [Jerry] Koosman, and [Gary] Gentry. And then there is the Braves with [Greg] Maddux, [John] Smoltz, [Tom] Glavine, and [Steve] Avery. That's a big-time staff." Q: And would you put your starting rotation this season up against any of those? Manuel: "If you're going to write them down on paper, they belong there. But we have to prove it, and only time will tell. That's the beauty of it. Yeah, we have a chance to have the best staff, but there is that little bit of doubt in there, so we have to wait to see them pitch and how they do." Q: Is this the most excited you've ever been at the start of a season? Manuel: "When I start thinking of our pitching staff and what it can be, this definitely is the most excited I've been in a long time. Also, I'm excited about getting started again because we finished the season on kind of a down note. I think our guys were disappointed we couldn't get to the World Series and that's how I left them that night. But now that we've picked up [Cliff] Lee, that's a big up for us. That shows where our organization wants to go and how much we're trying to get back to the World Series and win." Q: What's your most vivid memory of that October night when you were eliminated by San Francisco? Manuel: "Just our guys and how you could tell they were hurt. I think that will last through the winter and stay with them. We felt like we were the best team and we didn't accomplish our goal. I heard Lee at his press conference say that if we didn't go to the World Series, we wouldn't meet our expectations. But our expectations the last four or five years have been to go to the World Series." Q: You said recently you consider yourself a Phillie for life. Do you also consider yourself a Philadelphian and, if so, why? Manuel: "Yeah, I do. Everywhere I go, whether it's to the grocery store or out somewhere, there are people who I can talk to. Even when I go to [my home in] Winter Haven, people from Philadelphia want to talk to me. I definitely feel like in the last six years with the things we've done on the field that this is the place I belong, and this is where I want to stay. This is where I want to end my career." Q: What is your favorite thing to do in the city? Manuel: "On off days, I like to go down to the [Italian] Market and walk around. I'll go hit golf balls at times. Probably the biggest thing I like to do is get in my car and drive around. I like to go out in the city and in the country both in New Jersey and Pennsylvania. I love going up toward Reading and also into Amish country. I like to go up into Scranton. I like to go through the coal-mine areas. Over where I live in Haddonfield, I really like that. But most of my time is spent at the ballpark." Q: Where do you like to eat in the city or even New Jersey? Manuel: "I think there's a place called Giumarello's [in Westmont, N.J.]. It's a family kind of steak house. In the city, I like Capital Grille, McCormick & Schmick's, Smith & Wollensky, Ruth's Chris, and Ted's Montana Grill. I love the city. I like to just walk around in the city." Q: In the media guide, it says that you and Missy are engaged. So when's the wedding? Manuel: "I'll put it to you just like I tell her: When I get time. I mean that. That might sound like a cop-out. Seriously, when I can settle and get time . . . but let me tell you something, I look at Missy as my wife. It's just a matter of us getting married. I don't know what I'd do without Missy. She has been with me all through my health issues and I look at her as the woman I definitely want to be around and with." Q: What do you love most about her? Manuel: "She's funny. She laughs a lot, and she likes to do things that I like to do. She'll sit in the car and wait on me after games, and she never says anything about it. The only thing is she has trouble watching games, especially the real tight ones. She cannot watch them. It's too much for her. I actually don't like to talk about baseball with her. We don't talk baseball a lot, and maybe that's something I like about her, too, because that's my down time away from baseball when I'm with her. We just get along real good together." Q: You just talked about your [family]. How difficult was it to see what happened to Dallas Green's 9-year-old granddaughter out in Tucson earlier this month? Manuel: "I left Dallas a message, and I want to talk to him in person, too. It was hard for me to relate to something like that. I can't imagine having to deal with something like that. I've been thinking about it ever since it happened. I saw pictures of his granddaughter on TV. I don't even know her and I loved her. I don't know what I'd do if that happened to me." Q: There are millions of Phillies fans out there who want to buy their World Series tickets. Do you have to remind your team about the long journey they must take before that happens? Manuel: "Yeah, it's a long journey. We have to play. If we just play like we always have, then things are going to be good for us. That is always what has worked for us. We want to keep the part where we play the game right, show up on time, and focus on what we're doing." Q: You have two kids that we rarely hear anything about. Could you talk about them? Manuel: "My son [Charlie Jr.], he lives right outside of Miami. He lived in California for about 16 or 17 years. He graduated from Liberty Baptist College [now Liberty University] and ran an accounting department for a Japanese company. He went to high school a couple years in Japan. He graduated from a high school in Roanoke [Va.], but his sophomore and junior years he went to school in Japan and he ended up working for a Japanese company. Coming out of college, he worked for Household Finance, and he was sent to California, and he was sitting at a Benihana in Anaheim with a Japanese guy and they started talking about baseball. The guy asked him if he knew a Manuel who played baseball in Japan. He said, 'That's my father.' The guy gave him his card, and he gave him a job. He worked there for about 15 years, then about five years ago he went to Florida and started working for a pharmaceutical company that's based in King of Prussia." Q: So he had the Japan and Philadelphia connection going just like his father? Manuel: "Yeah. He's real quiet, but I'm very proud of him. He's a good kid. He's not a kid anymore. He's a man. I have two grandsons. Matthew is 7 and Mark is 3. I really enjoy being around them. I really like it when I get to spend a lot of time around them, but I don't get to do that much right now." Q: What about your daughter? Manuel: "My daughter, Julie, she got married last summer during the season. That's not supposed to happen in baseball, but that's my daughter. She went to Hollins University in Roanoke, and when she graduated she went to George Mason and got her master's degree. She works in Washington, D.C., and she's happy. I get to see her a lot in the summertime. She and her husband will come up on a Friday night and stay through the weekend. I enjoy being around her." Manuel: "Missy has three kids. She has twin daughters - Haley and Allie - who are 25 years old, and they're just like my kids. They are my kids. And she has a son, Collin. He's 27, and he's an assistant baseball coach at Polk State College in Winter Haven. He played one year of rookie ball for the Cleveland Indians, then went to a junior college and graduated from Weber State. He coached at Florida Southern for a year or two, and this year he took a job at Polk."